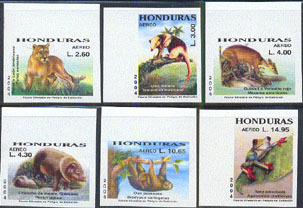 9080 ND HONDURAS (2004) Mountain lion*. Anteater*. Red brocket deer*. Collared peccary*. 3-toed sloth*. Tree frog*. Collection of 6 margin imperforates. Endangered animals. Scott Nos C1159-60,C1162,C1164,C1166-7.